Purchase all 3 CDs for just $35. *All individual CDs are also available at Panara Imports in Marquette, MI. Meet, activate & expand your NINE main energy centers with the 9 guided meditations from Chakras Alive! Exploring & Expanding Your Inner Rainbow. Narrated by author Roslyn Elena McGrath, with special acoustic background designed to support your chakra system. A healing journey that can have a profound influence, especially with regular use. Helped me get into that peaceful expansive feeling of loving and being loved! Positive, holistic and peace-enhancing. . . It will help you get in touch with your highest self and remind you of your potential when you get lost or over-burdened. 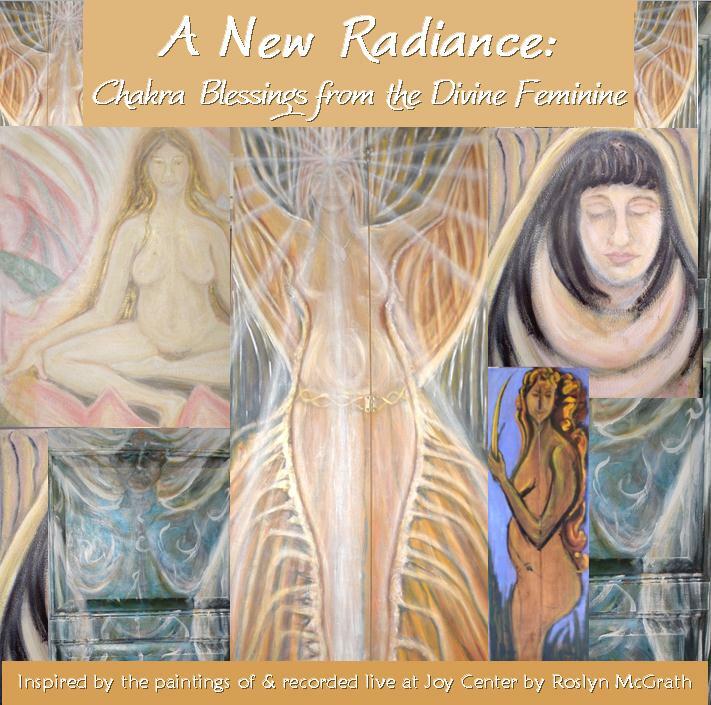 Experience each Goddess as a living presence and activate their specific powers in your body, mind and life to gift yourself a new radiance for healing, empowering all your facets with A New Radiance: Chakra Blessings from the Divine Feminine. Each guided meditation helps you access qualities within you for whole-self balancing and upliftment from the perspective of a particular Goddess archetype. Created from the catalytic place where art meets life by author, artist and healer Roslyn Elena McGrath. The 7 ½ – 10 minute tracks on this recording include Chakra Blessings from Kuan Yin, Goddess of Compassion, Isis, Goddess of Death & Rebirth, Lakshmi, Goddess of Prosperity, Kali, Goddess of Liberation from Illusion, and Nigoshkwe/Star-Woman, Goddess of Ongoing Evolution. This is poetry and beautiful and like a prayer. – Barbara R.
Relaxing, uplifting, encouraging, confirming… – Carol R.
I love these meditations! – Jean D.
*Learn more about Inner Goddess Workshops, Inner Goddess Guidance Sessions, and Goddess Gifts from Roslyn Elena McGrath. Specially designed for profound rejuvenation and transformation, Creative Wisdom Meditations is delivered in soothing, compassionate tones punctuated by silence for deep absorption. Click here to listen to a sample track. The 6 guided meditations assist with all the main areas of your life by developing your ability to nurture and empower yourself, let go of old pains and see things anew, create what you desire, accept the natural cycles of life and experience yourself as a glorious part of the larger whole. Used in conjunction with Creative Wisdom Cards, their positive impact increases exponentially. Tracks include Self-Nurturance, Acceptance & Confidence in the Cycles of Life, Self-Empowerment, Seeding Your Dreams Into Existence, Shifting Perspective, and Oneness With All-That-Is. Each 10 – 20 minute meditation takes you deep into yourself, where you can make major positive shifts with minimized resistance.